This year has been a truly special year with a lot of firsts for me. It was the first time I ever dined on a patio, the first time I ate with other food bloggers, the first time I had an alcoholic shot (which went rather awry), and the first time I was so sleep deprived that I experienced microsleeps. I could not have asked for a more amazing year. It was also the first time that I managed to get someone to pay for one of my sushi adventures. You see, this was not an easy accomplishment because I don't exactly eat like a normal person when it comes to sushi. As a bonus, Puzzlefighter was treating me to a luxury restaurant, Takifugu, whose menu featured an assortment of fancy nigiri. 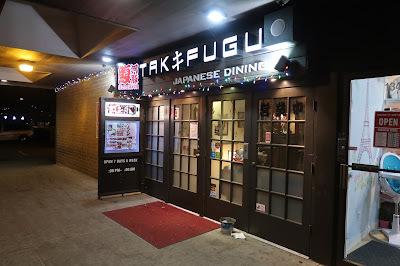 Takifugu is one of the higher-end Chinese-operated Japanese restaurants in Richmond. It is remarkably well hidden. As blind as I may be with everything else, I have an eagle eye for sushi restaurants, but I managed to walk right in front of Takifugu twice without noticing it at all. It is a very quiet place, and the whole time we dined, it felt like we were the only ones there. I'm not sure if I can ever bring myself to eat a pufferfish after seeing how adorable they actually are. I was slightly relieved to see that pufferfish did not make an appearance on the menu. Puzzlefighter enjoys and understands fancy nigiri just as much as I do, so off we started with a plateful of nigiri, which gave us plenty of conversation material for the next half hour or so. 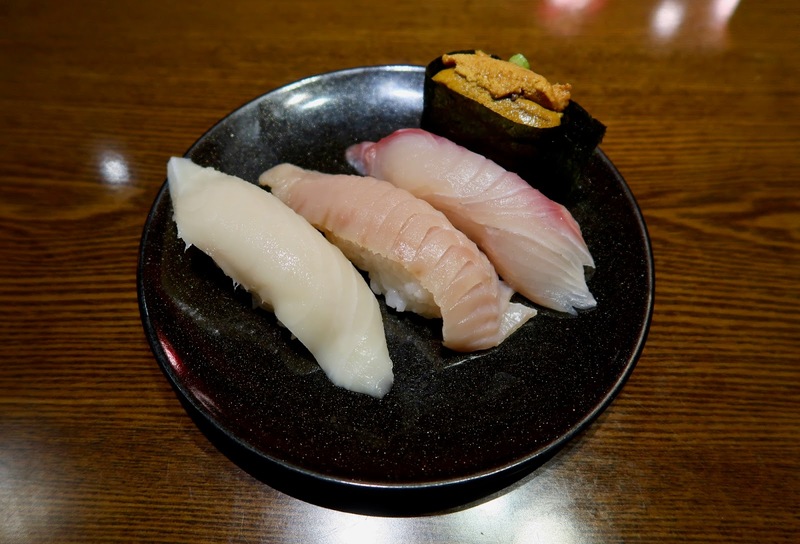 The first piece of nigiri we had, the Kajiki Nigiri (swordfish), had the most amazing soft and creamy texture we could imagine. It would have been an A+ in my books if the sushi rice had a little more flavour. 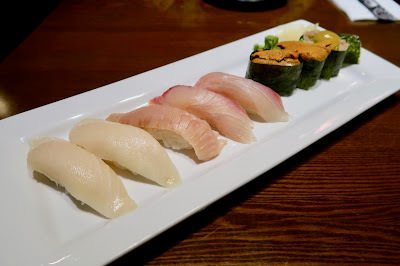 The Toro Nigiri (tuna belly) was slightly fishy, but the Kanpachi Nigiri (amberjack) was fresh and buttery. I was told the Uni Nigiri just came in earlier in the day, and it was indeed fresh, creamy, and melty. However, there wasn't enough uni, so the balance of flavours was a little off. I'm not exactly into the idea of consuming innards, but after being vehemently peer pressured by Puzzlefighter, I gave in and tried the Pork Intestine Skewer. Much to my surprise, it turned out quite crispy with a nice, chewy rebound. It actually tasted good to me. Uh oh... Next, the Beef Tongue Skewer was on the chewier side with a tad too much salt, but it was savoury and projected a pleasant, smoky flavour. Our platter of Assorted Veggie Tempura came with two pieces each of zucchini, eggplant, and yam, one piece of carrot, and some tempura enoki mushroom. 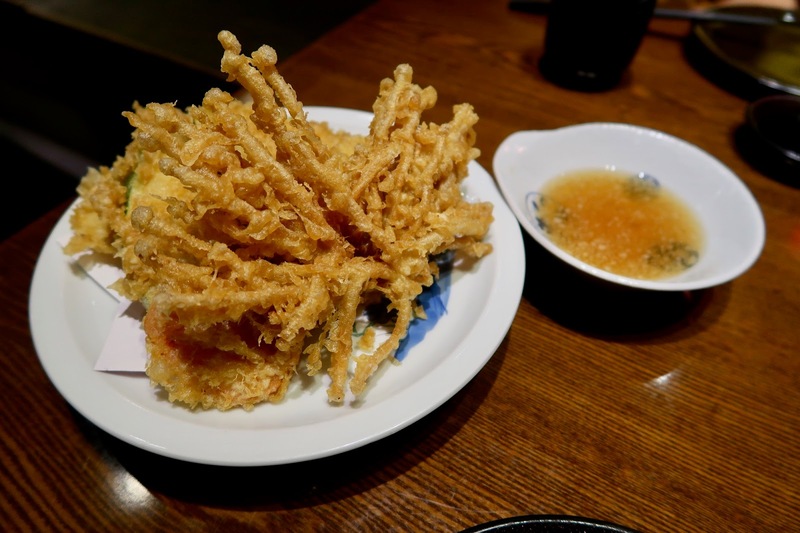 The tempura enoki mushroom had a very... erm... interesting appearance. As much as I enjoy novelty, there were many parts where I could only taste the batter. The other vegetables turned out to be juicy and flavourful. The only catch was that the batter was quite greasy. 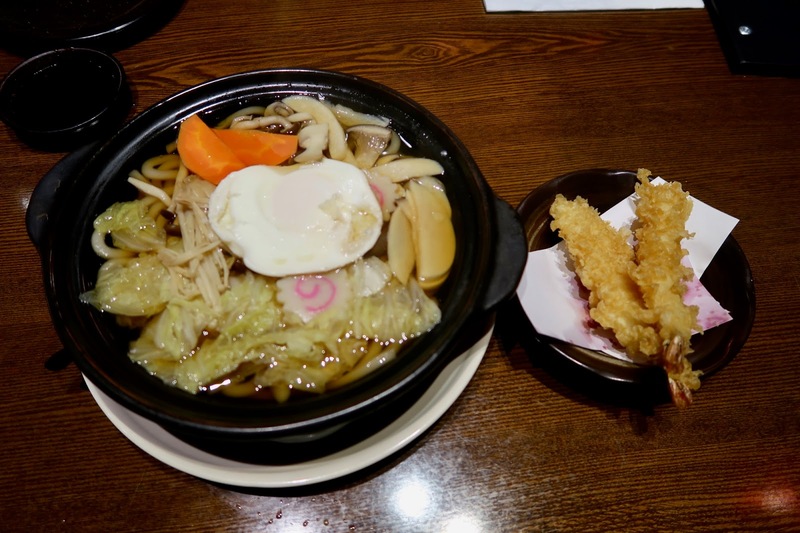 For our filler, we got the Nabeyaki Udon, which came with two tempura prawns on the side. The udon noodles had a nice chewiness, and the dish as a whole was generally well-prepared. The mushrooms went well with the udon, and the broth was light and well-balanced. The prawns also had a decent, meaty snap, though they shared the same greasy fate as the Assorted Veggie Tempura. The service was friendly and respectful during our visit. 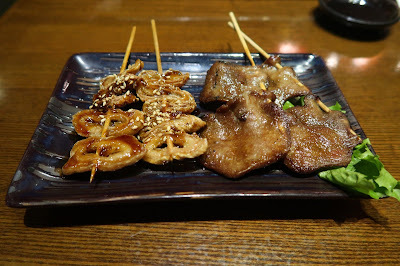 Like many other Japanese restaurants in the area, the food at Takifugu is pricey given the quality. Puzzlefighter paid almost $80 to get us out of there. However, they sometimes have seasonal specials that offer a significant discount from their regular prices. One such special was the Lobster Sashimi Dinner for 4 for $138. We actually spent a significant amount of time debating whether the two of us could finish a dinner for four, and now, I slightly regret not attempting the challenge. After all, one of my favourite sayings is "there's no such thing as too much sushi."